I've seen few times this trick on the web, and I did try it for you : DIY enamel dots. This will be my inspiration post for the Feeling Sketchy blog. You will need fusible beads, an oven and a cookie sheet with parchemin paper. 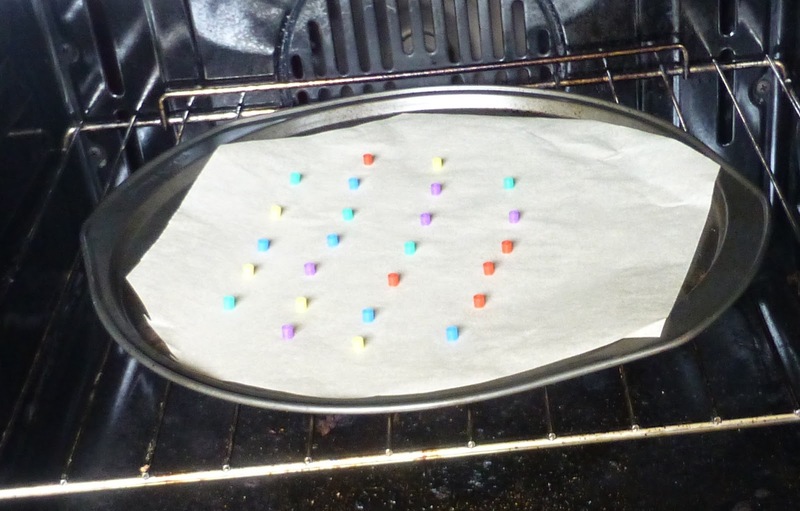 Place the fusible beads on the parchemin paper, and put it in the oven at maximum heat for few minutes. Let them cool completely and you will have new enamel dots ! You can make bigger dots by melting several beads together. Such a pretty rainbow of embellishments, Valerie. I've been meaning to try this. Love how they turned out! Sadly, I gave all of DD's Pearler Beads away when she grew out of them! wow! those turned out great!!!! Cool! Yours came out great! The scrappy world will never be same! DIY enamel dots!!!!!!! !